Hjalmar Branting was a famous Statesman from Sweden, who lived between November 23, 1860 and February 24, 1925. He became 64 years old. Karl Hjalmar Branting (born November 23, 1860, died February 24, 1925) was a Swedish politician and the press mann. 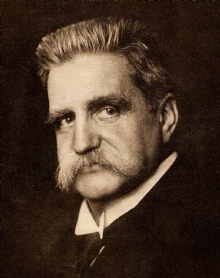 Hjalmar Branting, Prime Minister of Sweden during three periods: 1920, 1921 to 1923 (when he was foreign minister dessuten) and 1924-1925. He was awarded the Nobel Peace Prize in 1921. He is born under the zodiac sagittarius, who is known for Philosophical, Motion, Experimentation, Optimism. Our collection contains 20 quotes who is written / told by Hjalmar. "There is no reason why agreement on particular points should not be both possible and advantageous to the so-called neutrals and to one or more of the blocs, either existing or in the process of formation, within the League of Nations"
"The World War broke out with such elemental violence, and with such resort to all means for leading or misleading public opinion, that no time was available for reflection and consideration"
"It is a commonplace that the League of Nations is not yet-what its most enthusiastic protagonists intended it to be"
"I do not overlook the fact that the appearance of these new, free nations in the European political community not only celebrates the return of the prodigal son but also creates new sources of friction here and there"
"Fraternity among nations, however, touches the deepest desire of human nature"
"But it is possible that, in the days ahead, these years we have lived through may eventually be thought of simply as a period of disturbance and regression"
"As a result of the World War and of a peace whose imperfections and risks are no longer denied by anyone, are we not even further away from the great aspirations and hopes for peace and fraternity than we were one or two decades ago?" "All in all, the League of Nations is not inevitably bound, as some maintain from time to time, to degenerate into an impotent appendage of first one, then another of the competing great powers"
"Last year, the Assembly of the League, as a result of the initiative taken by the Scandinavian nations, further limited and clarified all the provisions of the clause prescribing the duty of states to participate in sanctions"
"Before the war there were many who were more or less ignorant of the international labor movement but who nevertheless turned to it for salvation when the threat of war arose. They hoped that the workers would never permit a war"
"We here in the North have for many years had a natural tendency to feel that when our representatives come together at an international meeting, we embark on the quest of mutual understanding and support"
"The equality among all members of the League, which is provided in the statutes giving each state only one vote, cannot of course abolish the actual material inequality of the powers concerned"
"No nation is so great as to be able to afford, in the long run, to remain outside an increasingly universal League of Nations"
"And the annual meetings of the League's Assembly are in effect official peace congresses binding on the participating states to an extent that most statesmen a quarter of a century ago would have regarded as utopian"
"We must remember that the people for whom this change represents a first taste of freedom and a new and brighter future did not allow their resolution to falter, no matter how great the suffering by which they bought this independence"
"As long as the problem of world reconstruction remains the center of interest for all nations, blocs having similar attitudes will form and operate even within the League itself"
"A formally recognized equality does, however, accord the smaller nations a position which they should be able to use increasingly in the interest of humanity as a whole and in the service of the ideal"
"At Geneva, the neutral states were often in agreement concerning the preliminaries for Genoa, and Genoa itself was marked by a quite natural mutual exchange of ideas"
"The kind of support encouraged by such modes of expression has always arisen basically from confusing the fatherland itself with the social conditions which happened to prevail in it"
"Let us return, however, to the League of Nations. To create an organization which is in a position to protect peace in this world of conflicting interests and egotistic wills is a frighteningly difficult task"